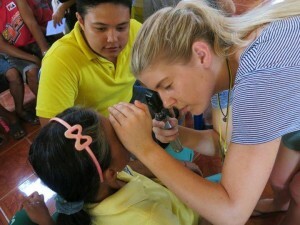 As well as providing funds for a diverse range of local programs to assist young people to develop, each year the Rotary Club of Canterbury takes four final year Orthoptics students to an island of the Philippines. Proceeds from the Aussie Pride badges help fund this unique educational opportunity for these young Australians. 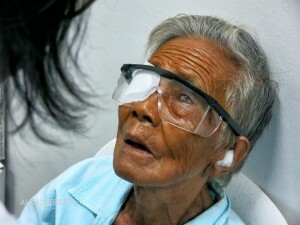 In partnership with the Cataract Foundation, sight is restored to hundreds of some of the poorest people in that country. Members of our club fund their own way to participate in this project each year. 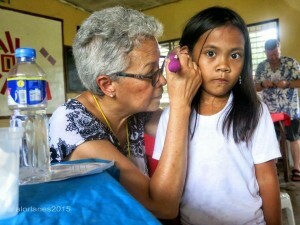 We also screen primary school students for hearing. We will have been doing this project continuously for 22 years. Local surgeons donate their time to perform the operations using the operating microscopes donated by Melbourne hospitals and shipped to the Philippines using funds generated in part through sales of the Aussie Pride badge. It is a wonderful thing to see the smiles on the faces of the people the day after their operation, when the patches come off and they can see again. Or for some young people, they see for the first time in their lives ! This young man had congenital cataracts in both eyes, making him totally blind. This grandmother will have her independence restored. She was blind in both eyes. 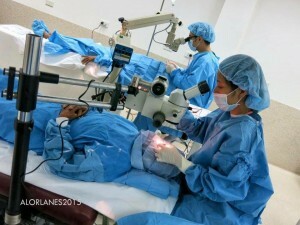 Volunteer surgeons conduct hundreds of eye operations each day during our mission.